This data set provides concentrations of soil phosphorus (P) compiled from the peer-reviewed literature that cited the Hedley fractionation method (Hedley and Stewart, 1982). This database contains estimates of different forms of naturally occurring soil phosphorus, including labile inorganic P, organic P, occluded P, secondary mineral P, apatite P, and total P, based on the analyses of the various Hedley soil fractions. The recent literature survey (Yang and Post, 2011) was restricted to studies of natural, unfertilized, and uncultivated soils since 1995. Ninety measurements of soil P fractions were identified. These were added to the 88 values from soils in natural ecosystems that Cross and Schlesinger (1995) had compiled. Cross and Schlesinger provided a comprehensive survey on Hedley P data prior to 1995. Measurement data are provided for studies published from 1985 through 2010. In addition to the Hedley P fraction measurement data this data set includes soil order, soil pH, organic carbon and nitrogen content, as well as the geographic location (longitude and latitude) of the measurement sites. 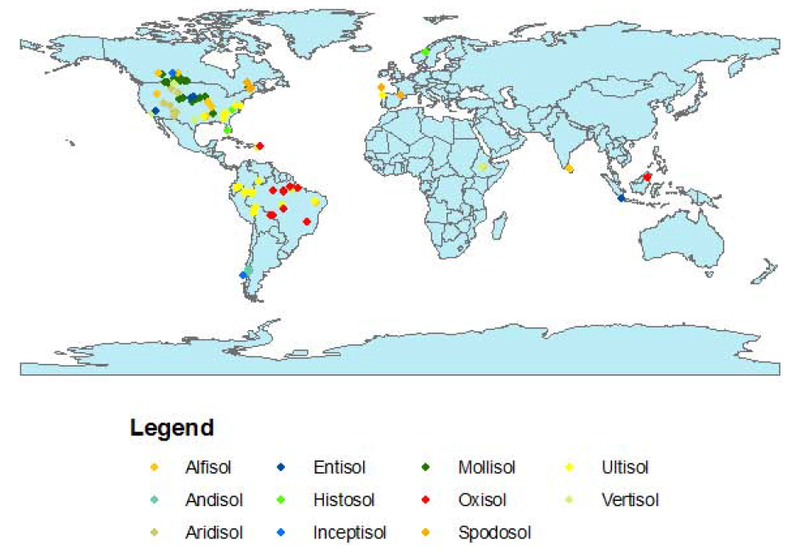 The spatial distribution of the sites is shown in Fig. 1. There is one comma separated (.csv) data file. Figure 1. Distribution of measurement sites. The legend identifies the USDA major soil order of the soils at a location. Some locations contain multiple data entries. Acknowledgements. This research was sponsored by the US Department of Energy, Office of Science, Biological and Environmental Research (BER) programs and performed at Oak Ridge National Laboratory (ORNL). In addition to the Hedley P fraction measurement data this data set includes soil order, soil pH, organic carbon and nitrogen content, as well as the geographic location (longitude and latitude) of the measurement sites. There is one comma separated (.csv) data file. Missing values are represented as -9999. 17 Reference Author name and publication year. See reference companion file, References_HedleyPdatabase.pdf, for complete citation. Measurement data are provided for studies published from 1985 through 2010. No specific sampling and analysis dates are provided. As described in Yang and Post, 2011, by analyzing the Hedley-labile P and vegetation P demand, the amount of labile P is much greater than vegetation demand, even in highly weathered soils commonly considered P limited. They concluded that labile P measured by Hedley fractionation method should not be defined as plant available P since most of this labile P likely ends up as immobilized by microbes. Analysis of the database also shows that carbon (C) and nitrogen (N) in soil organic matter are closely linked in all soil orders, but P is decoupled from C and N in highly weathered soils with larger variations of nitrogen:organic P (N:Po) ratio and higher mean values of N:Po ratio, compared to slightly and intermediately weathered soils. Table 2. Percentage of P (mean ± sd) in different fractions based on Hedley P database. From Yang et al., 2013.. This is an expansion of an earlier study (Cross and Schlesinger, 1995) that summarized Hedley P data and created a larger database that included 178 published Hedley fractionation P measurements. This recent literature survey was restricted to studies of natural, unfertilized, and uncultivated soils since 1995. Ninety measurements of soil P fractions were identified and were added to the 88 values from soils in natural ecosystems that Cross and Schlesinger (1995) had compiled. Cross and Schlesinger provided a comprehensive survey on Hedley P data prior to 1995. Measurement data are provided for studies from 1985 through 2010. In addition to the Hedley P fraction measurement data we also compiled information on soil order, soil pH, organic carbon and nitrogen content, as well as the geographic location (longitude and latitude) of the measurement sites. The Hedley sequential fractionation method (Hedley and Stewart, 1982; Tiessen and Moir, 1993) has gained considerable attention as a useful tool to examine different forms of soil P and provides a comprehensive assessment of available P in soils (Johnson et al., 2003). Cross, A. and Schlesinger, W.: A literature review and evaluation of the. Hedley fractionation: Applications to the biogeochemical cycle of soil phosphorus in natural ecosystems, Geoderma, 64, 197–214, doi:10.1016/0016-7061(94)00023-4, 1995.